Happy Kitchen Sink Stamps Monday, I'm glad you stopped by, today I have another wedding card to share, using the Multi Step Wedding Rings from Kitchen Sink Stamps. I had something totally different in mind when I sat down in my studio to create my card for today's post, but I'm really happy with the way this card turned out. 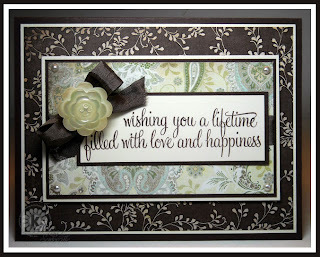 I just love the Basic Grey Cappella papers with the new Kitchen Sink Stamps Wedding sets. The sentiment is stamped in Chocolate on Vanilla card stock. To embellish my card, I added some Chocolate Seam Binding, a button from the Accoutrements Line by Tim Holtz, and a few Basic Grey Half Pearls. For the inside I stamped the sentiment in Chocolate using a Stamp-a-ma-jig, then stamped the Wedding Rings over the sentiment. If you missed my previous video on how to stamp the Multi Step Wedding Rings, you can view it in this post. Lovely wedding card, Lisa! Love it all.. inside and out!! Sweet card, luv the papers! Gorgeous work with this fabulous wedding set and these great papers!! Love that fabulous button!! Great work, Lisa!! Wow, this is just so gorgeous! Never thought of seam binding and the TH flower is perfect!! 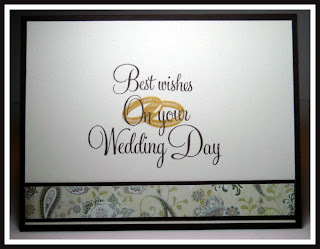 This is such a beautiful wedding card, Lisa....sooo elegant!!!! Beautiful Wedding card, Lisa! I love you used the sentiment as a focal point. Pretty DPs and wonderful inside, too! I really like this card, very simple yet elegant. What a beautiful wedding card. You have worked some serious pieces of art with that Basic Grey paper. Wow! Lisa this is georgous, I love the simplicity of just a sentiment. Beautiful colors and layout. This is beautiful, inside and out, Lisa! I just love that capella paper...makes such wonderfully elegant cards!! Gorgeous wedding card! Love the layering of rings and sentiment.